A taxi driver was physically assaulted by a policeman for allegedly jumping red traffic light in Accra, Ghana, on Tuesday, May 2. 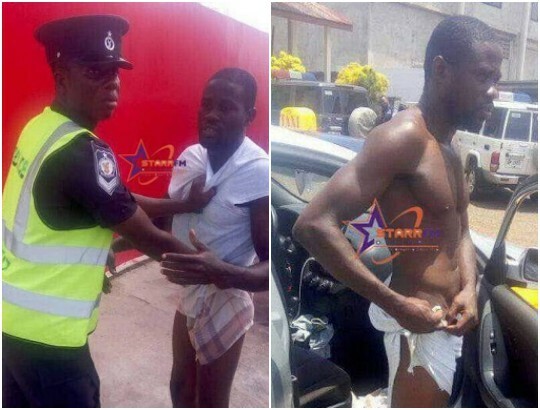 The policeman Gabriel Tabiri accosted the cab driver identified as one Kwabena Danso at a Fuel Station after allegedly jumping the light and ended up tearing apart his clothing. "Frequent users of that Anyaa stretch of the highway know that particular traffic light is faulty. It is usually on amber or switches to red and within a blink of an eye it turns green then amber then red,” Danso explained to StarFM and has been corroborated by drivers who use that road often. “I was surprised the police officer came all the way to the filling station and said I was under arrest. I explained to him that the light doesn’t work and it’s a fact and even pointed it to him, but he insisted I have flouted traffic regulations. “He kept pressing that we should go to the police station and I said he should sit in my car so we go together. However, he refused on the basis that there was someone already in the car. But I told him I can’t walk to the station when there is a vehicle which could make our journey faster and easier. “This resulted in an altercation and suddenly he held my shirt and began pulling and squeezing me by the neck. I restrained myself because of his uniform, but he went beyond his boundaries when I realised my dress was torn in the process. 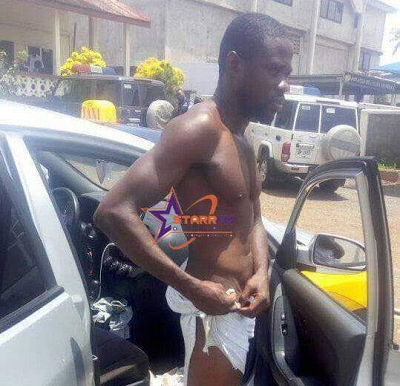 I was expecting him to give me some level of respect when it was left with my boxer shorts on, but he didn’t and kept stretching that too until I was stark naked in public,” Danso narrated his ordeal. “when I realised I was being disgraced, I decided to defend myself and that resulted in a physical brawl before I could gain my freedom. It took the intervention of the boys around to free me from his grips.”Danso had to go to a nearby shop to get a new attire to cover his nakedness. He said he is currently suffering some pains on his forehead, chest and neck after struggling with the police officer. The law enforcement agent left the scene and never pursued the case again, Danso added. He has since reported the case to the Police Intelligence and Professional Standards (PIPS) Directorate.